I heard the clicking of a mouse and the whir of a distant printer in the background as she booked me in to see the fertility specialist later that day to investigate what had happened. This was my third medicated cycle without even managing to get me to ovulate and none of it made sense. I had a perfectly good looking 16mm follicle the week before that had vanished a few days later leading us all to believe that I had finally released an egg! I hadn’t. I drove in silence to the clinic and tried to stop my mind from visiting the familiar dark places. Undressed from the waist down with a paper-thin sheet draped across my lap, I waited for the doctor. Two knocks. He opened the door. “Emma!” he started, pulling up the rolling chair and plopping himself down on it. “Your body isn’t playing by the rules! I thought it would be so simple. We’d give you the letrozole, you’d ovulate, and you’d get pregnant!” Me too, doc, me too. “It’s never a good thing when you surprise the doctors, is it?” I managed through a tight smile as I met his gaze. He performed the ultrasound where we found only small follicles and no evidence of ovulation or early pregnancy. Things were “looking quiet” as he said. So we came up with a new plan of two parts. First, because my lining looked good, we would skip my next period and start taking the same high dose of letrozole again beginning that night – this would be the last time I’d take oral medication (before discussing moving to injectable drugs and/or IVF). Second, if at the next scan in 9 days we saw a follicle over 17mm we would wait a day or two and give me an injection of HCG (to force the egg to release in 36 hours). I left that appointment with a new prescription and a heavy heart. Reid’s birthday was in a few days and for the past year I’d been clinging to the thought that I would be pregnant again by his first birthday. However, that was not in the cards anymore. I can’t even describe that feeling of total defeat. On April 3rd, the anniversary of Reid’s passing, I woke up bleeding. It was a Sunday and the clinic was closed and I was too busy grieving to do much about it. Then the next morning, on Reid’s birthday, I woke up early to share my post for Reid’s Reads. I didn’t want to give any time to our fertility treatments but I knew I had to call the clinic about the bleeding. So I dialed the number, talked to the nurse, and was scheduled in to see my doctor first thing the next morning. The rest of that day was beautiful though. All of the love that poured in for Reid’s birthday made the whole day exciting and peaceful instead of filled with dread and grief. It made us proud to see the strength and openness that Reid has inspired in the hearts of so many. On April 5th I had a very long conversation with the fertility specialist. He said that he wasn’t sure why I was bleeding but he was sure it would stop soon. I told him that’s what they said when I bled in the middle of my cycle in September and that lasted for 41 days. He said he knew it was hard for me to believe him, but he wanted me to know he hadn’t given up. The plan was to wait until my normalized day 12 that Friday April 8th and perform an ultrasound then. “Sure. I bet she could learn a lot from a complicated patient like me.” I joked. After the appointment I spent a few minutes with the nurse learning how to administer my injection. She giggled as I took photos and notes of everything she showed me and assured me that the actual needle wouldn’t hurt and I shouldn’t worry, but stabbing myself in the stomach seemed like a good reason for a little bit of concern. I left the clinic that day with a tiny $100 syringe filled with human chorionic gonadotropin, my wallet was a little lighter but my spirits were too. I went to grab a coffee after – my usual post-appointment routine – and let me tell you, it’s pretty strange walking into a café with a needle stashed away in your purse! The next day was injection day and Aaron and I had plans to be out with his family in Langley (an hour out of the city) but we were supposed to do the shot around 2pm. Turned out Angela, who is a nurse (and Aaron’s brother Derek’s fiancé) was also going to be there, and since we figured Aaron could use a little coaching (Read: a lot. He had been stressing about this since we found out I’d need the shot and I declared I would absolutely not be doing it myself) we made our way out to the valley. The family gathered around and started shouting excitedly that we were all making a baby as we watched Aaron practice stabbing motions – I think that was the most terrifying part. At the last minute Aaron decided he couldn’t stab me after all and passed the needle to Angela. After calming me down, grabbing my fat, and giving me a quick poke it was all over. Really, it wasn’t so bad. The worst part was feeling the medication spread after the injection. And the only side effects I had were some bloating, mild nausea, and headaches. I knew then that I would do a thousand more to bring our next child into this world. Fast-forward to the following Friday the 15th and I was at the blood lab at 9:00am to get my progesterone levels checked. In BC where I live you can see your results online so I basically spent the rest of the day refreshing my account on my computer every 10 minutes, and then on my phone when I had to leave the apartment. By 7:00pm (it was a lot of waiting) the results were finally in. I knew I needed a level of around 10 nmol/L, so I clicked on the results and waited for the page to reload. I’d ovulated! For the first time since I became pregnant nearly two years earlier I had finally ovulated. As we passed on the news to eagerly awaiting family—it’s a very unique feeling having the people closest to you have intimate knowledge of your cycle and conceiving efforts—I kept reassuring them that no matter what happened we would be fine because at least we had hope now, at least we knew my body could ovulate again. But I had such a strong feeling that this cycle would bring us our second child. The following week was tortuously long. I spoke with a nurse from the clinic on Monday who confirmed the results and said that based on the levels it would appear that both of my follicles released eggs, so there was a possibility of twins if I did get pregnant! She scheduled my pregnancy test for Friday April 22nd, the full moon, but starting on Sunday the 17th I was able to take home pregnancy tests so that I could test the HCG out of my system (the downfall of the trigger shot is that the HCG generally stays in your system for 10 days after, which makes early pregnancy tests, which I tend to do each month, highly inaccurate). 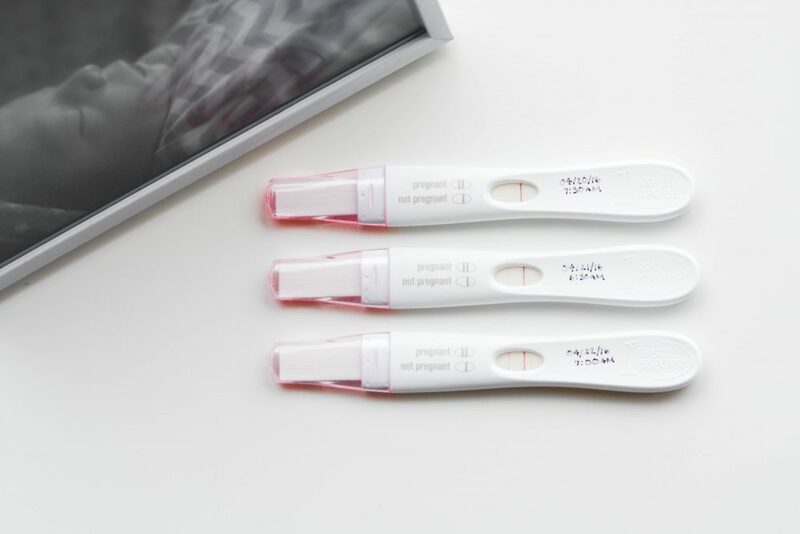 I used the Clearblues I had on hand, not wanting to see two pink lines on a First Response until I was ready to actually test for pregnancy, and watched a faint little cross appear to signify positive. Knowing that it was the trigger shot I just noted it down and threw it out. On Monday I took another test and this time the second line was barely visible. Then on Tuesday, 10 days after my injection, my test was completely negative. Any positives going forward would be the real deal, and I knew I would be testing the next day, unable to wait until the blood test on Friday. At 7:30 am on Wednesday April 20th I took a test—a First Response. And for the first time since I found out I was pregnant with Reid there was a second pink line. Granted, it was a very, very faint one, but I didn’t need flashlights or sunlight to see it. It was there, and I couldn’t believe that after all this time a little life might be too. I didn’t dare jinx it before my blood test on Friday by saying that I definitely, without a doubt was pregnant, so I decided I needed to see that line get darker the next day before letting myself go there. But I told Aaron that morning, fighting back tears with that pregnancy test clutched in my hand like it was my lifeline. I recognized a glimmer of happiness in his eyes that I hadn’t seen in a very long time, and I’ll always remember that—the look that signaled the start of our emergence from a year of deep grief. I don’t think his eyes focused enough to see the second line but he still gave me a big squeeze and a bunch of little kisses and pulled me back down to coax me back to sleep for a bit. I was up again a few minutes later knowing it would be impossible for me to sleep. Everything was changing, going a million miles a minute, and in that moment, in the before, all I wanted was for things to slow down. On the morning of the April full moon I woke up early and took another test to brace myself for whatever news might come our way that day. Two pink lines, the second even darker still. With that knowledge I walked down to the blood lab, the same one I’d done my first pregnancy blood test with Reid, with hope expanding in my chest. In the room, the woman taking my blood smiled and asked if I knew the answer to this test. I said that this was the first blood test so I didn’t know anything for sure yet. She nodded and wished me luck as she stuck a band aid on my arm, and I left with my phone already open to the online results account. I’m really not a very patient person. Aaron and I decided that since our families already knew we were taking the test that day that we wanted to make our announcement special if there was good news, this baby deserved the same as Reid. So we told each family that we wanted to meet them at Pajos, the outdoor fish and chips restaurant in Steveston, and didn’t tell them that the other family was coming. We figured if the blood test was negative that we’d want to be around family anyways, and if it confirmed what we already knew in our hearts then we’d have everyone together to share in our joy. I was getting messages all day asking if I knew anything yet, and after each text I’d refresh my online account. I was going crazy. Eventually it was time to leave for dinner and there was still nothing—I had no idea what we would do if we didn’t find out before having to face our families. The drive to the restaurant is thirty minutes from our apartment so I kept hitting that refresh every two minutes. We were passing W 49th street going south on Granville when I first saw that pink Y signifying “Results out of range” (a good sign for pregnancy). I looked to Aaron and whispered, “They’re in.” I held my breath and clicked open the file and saw a big bold 42 IU/L. In the 3rd week of pregnancy they look for levels between 5-50. It was official. I was pregnant. “It’s positive! I’m pregnant! I’m really pregnant!” Right there in our trusty ‘ol Ford, driving down Granville street with the glow of the full moon shining hazy through the rain clouds, we found out that our family of three was finally a family of four (or five, we’d joked then). We were all there, our small family, and we felt Reid’s presence so strongly, guiding us into this new chapter with the most beautiful gift on the full moon of his birth month. This past year of terrible struggles and all-consuming lows had finally taken a turn. And honestly, even with all of the heartache, I couldn’t have planned any of it better if I’d tried. All of those times I found myself in tears, hiding under the covers, praying with my last threads of faith that God would give us a miracle, this was all part of the plan, and His plan is so good. It’s not always easy to accept this, especially in the midst of terrible loss and heavy grief, but sitting here now it’s starting to make sense. We broke the news to our families in the parking lot of Pajos just as the rain started to come down. There were lots of tears, lots of hugs, and lots of smiles. Pajos had actually closed for the evening, so we ended up ordering takeout from our favourite pizza joint and another local fish and chips shop and took the food back to my parent’s place in Steveston. There was champagne (and sparkling lemonade) and animated conversations and big belly laughs that filled the room. The last time I’d seen us all so happy was when we were all in that same room for Reid’s gender reveal. It was truly incredible to see the joy overflowing from the ones that we love again. The life-changing power of a tiny human is something special to behold. Now here we are, 14 weeks in and starting the second trimester. The anxiety is minimal and the love runs deep and this new life is changing everything. With each minute that passes as Reid’s little sibling grows we learn more about our faith, our passions, our dreams, and ourselves. There are a million ways that we aren’t ready to parent a child on this earth, but all we need is the one way we already are: we’ve loved this child since the beginning of their days, and we will love them all the rest of ours.